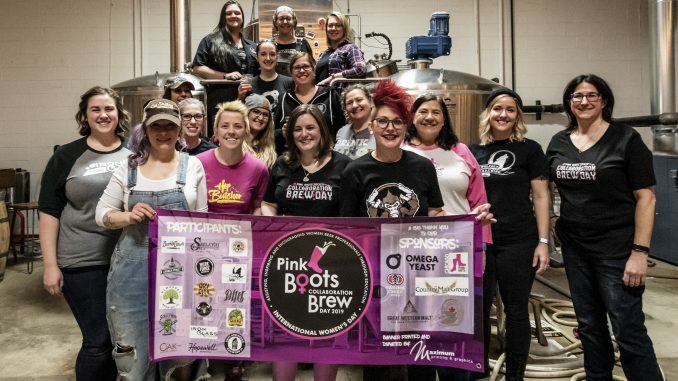 After bringing together more than 20 women from a dozen suburban microbreweries earlier this month in recognition of International Women’s Day, the resulting collaboration beer, “Hold My Crown,” is hitting taps at 10 breweries and one local bottle shop this week. Chicago’s Omega Yeast Labs donated a pitch of its Jovaru TM Lithuanian Farmhouse yeast for the project, a strain that has been nurtured for decades by Aldona Udriene, the “queen of Lithuanian farmhouse beer,” at her brewery in Jovarai. The grain bill, which consists of 2-row, Idaho Pilsner, flaked rye and honey malt, was donated by Country Malt Group, Great Western Malting and Canada Malting. A blend of Loral, Glacier, Sabro, Mosaic and Simcoe hops from Yakima Chief was selected by PBS for the annual collaborative brew day, lending a tropical dankness to the brew. Photos and video from the brew day were captured by Matt Adema Media and are available via the links below. Art for the beer is also available. A skeleton key is a single key that can open many different doors—which is what we aspire to be. Our taproom is one such door, through which you can find delicious beer, camaraderie and community. Our classes are another, through which you can develop an even deeper appreciation for craft beer and get into the nitty-gritty of how to make it. And our incubator is the third door, through which a selected individual can gain access to the tools they need to make their own dream of opening a brewery a reality. We’ve got more doors in mind, too…For current draft list, classes and incubator information, visit skeletonkeybrewery.com.